LEFTY PRODUCTION CO. - ONE-STOP SHOP GARMENT AND ACCESSORY DESIGN, DEVELOPMENT & PRODUCTION - Lefty Production Co.
Lefty Production Co. is a one-stop shop design house, apparel and accessories manufacturer, and Made–in-the-USA fashion factory based in the heart of Los Angeles. We guide new and established clothing and accessory lines through sketching and design, fabric and trim sourcing, labels and branding, pattern and sample making, duplicates, fittings, pattern revisions, marking and grading, cutting, production and packing. From our years in the fashion business, we know how difficult it is to find reliable and honest garment and textile manufacturing partners and vendors. We have learned our lessons the hard way and now get to spare our clients the same heartache. In this challenging business, you need a partner you can trust, not only to be honest with you, but also to have your best interest at heart. We are that Extremely Unique Partner. “Lefty has been absolutely vital in bringing our concepts and designs to fruition since the very beginning of our journey as an emerging apparel brand. From development and sourcing to production and finishing, Marta and the wonderful team at Lefty guided us every step of the way keeping high quality-control standards of paramount importance throughout the entire process. We are as thrilled with the results as we are the experience of working with such a talented and enthusiastic crew." "As a new brand, Lefty was integral in providing the professionalism and expertise we needed in a production company from start to finish. It was crucial to have a solid partner as we launched our new collection, and we were delighted with their attention to detail and stellar communication. Plus, they are wonderful people to work with!." "We've worked with Lefty for years now. The team has taken the lead on the development of nearly all our new products. We care greatly about all the little details and the team at Lefty has worked with us to develop products of the highest standard. We also love how Marta runs things like a family operation with a genuine concern for her customers." "Much of our success can be traced back to Lefty Productions. The Lefty team have proven to be excellent partners". There is nothing like finding a company - whose mission, ethics, flexibility, inclusivity, sustainable practice and forward-thinking goals - makes you proud to know and suggest to colleagues and students - our future fashion professionals. Giving a chance to new designers in the marketplace is the business model all entrepreneurs should follow...but few do. Marta Miller does! The Clothing Manufacturing Partner You Can Count On. Our clothing production clients include large department stores, online retailers, major labels and independent brands in America and around the world. We develop and produce womens, mens and childrens wear, and specialize in swimwear, active wear and athleisure styles. We can also help you with hair accessories, leather goods, handbags and home textiles in addition to all of your garment and apparel production needs. The garment manufacturing company you choose can make or break your business. As a trusted domestic apparel manufacturer, Lefty Production Co. will ensure you end up with products you can be truly proud of. Our goal is to ensure you quality service and beautiful products. No matter what your product vision may be, our highly skilled Los Angeles accessories and clothing factory has the expertise to bring your fashion vision to life, right here in the USA. We regularly speak to students at fashion programs including FIDM and Santa Monica College and offer them tours of our facility. Gigi Hadid is a fan of our bomber jackets! We made the official uniforms for Season 2 of NBC's Spartan Ultimate Team Challenge! Come visit our factory right in the heart of the Los Angeles garment district. These personalized bomber jackets were spotted on celebs everywhere. 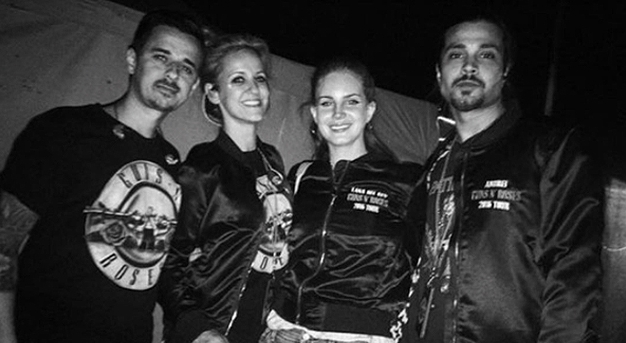 We made the official Guns N' Roses tour bomber jackets. We also made the official uniforms for Season 2 of Netflix's Ultimate Beastmaster! Britney Spears was snapped working out in this adorable sports bra we made! We were so proud to be included in the prize package for winner of Project Runway Junior Season 2. Check out the pajamas we made for the world famous Beverly Hills Hotel! Kendall Jenner and Gigi Hadid are fans of the pajamas we made for the world famous Beverly Hills Hotel. Our sketch artists can help bring your vision to life. We can also produce a variety of bags and accessories. Our incredible client, Mimi The Label, all over InStyle.com! It was such an honor to have our services included in the official prize package for the second season of Project Runway Junior! We also made the official team athletic uniforms for Netflix's Ultimate Beastmaster Season 2! We loved creating unique looks for teams from USA, China, India, Italy, Spain and France! Come see our brand new automated laser cutter in action! Lefty now offers intricate laser cutouts!